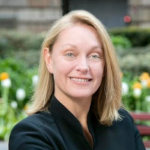 Denise Leonhard is the Senior Director of Global Credit Expansion at PayPal focused on growing both the PayPal consumer lending and merchant lending businesses. Prior to this role, Denise led the PayPal North America Corporate Strategy team. Previously, Denise was Vice President of Business Development and Strategy at American Express and a management consultant at Oliver Wyman. She holds an MBA from the University of Pennsylvania and an AB from Princeton University.